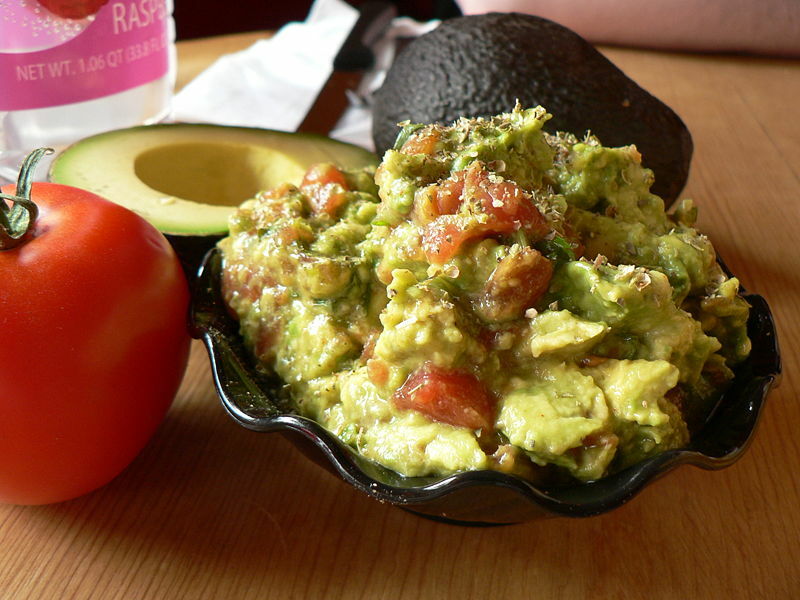 Guacamole is an avocado-based dip which originated in Mexico. It is traditionally made by mashing ripe avocados with a molcajete (mortar and pestle) and adding tomatoes and seasonings. Guacamole was made by the Aztecs as early as the 1500s. The name comes from an Aztec dialect and means "avocado sauce". After the arrival of the Spanish conquistadors, guacamole became popular in Spain. Ripe avocados, tomatoes, onions, lime or lemon juice, and salt are common to most recipes. Lime juice adds flavor and slows enzyme-caused browning. Other common ingredients include cilantro (coriander leaf), black pepper, jalapeños, and garlic. Halve and pit the avocados; with a spoon scoop out the flesh into a bowl. Mash the avocados leaving them a bit chunky. Add the remaining ingredients, and stir everything gently together to mix. Season to taste with salt and pepper. The recipe makes about 1 cup.